​This work is installed at Lewis Ginter Botanical Garden in Richmond, VA. 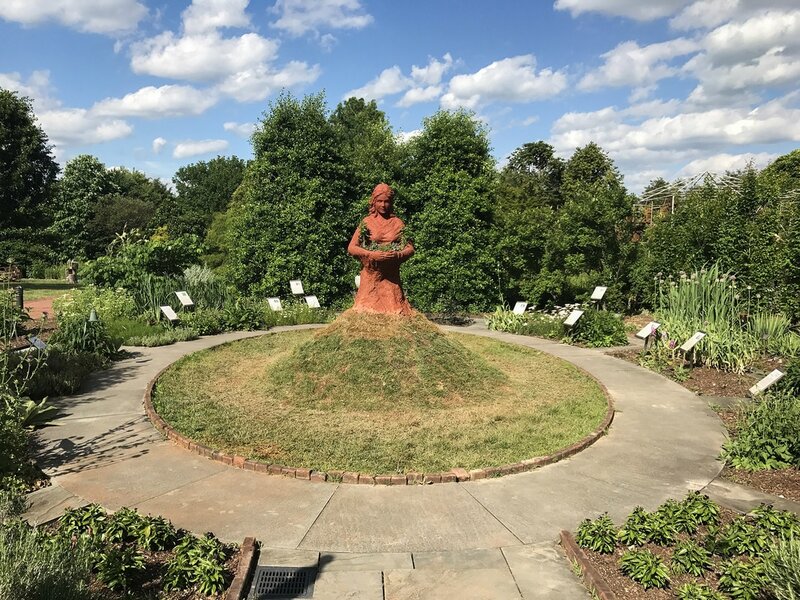 It is on display in the center of the Healing Garden, with medicinal herbs growing around the perimeter. This work depicts a female figure holding out her arms in a cradling position. Healing herbs are growing from inside the figure’s arms. The figure’s body expands down, merging with the earth. By depicting the figure as part of the landscape and an extension of the environment, the sculpture symbolizes a human connection to earth. The work also represents the power of earth to provide, nourish and facilitate life. The work was inspired from visiting the gardens, and is part of an ongoing vision to incorporate landscape with the human figure. The sculpture is 7.5 feet tall. It is made from clay, dirt, rocks mixed with a small amount of cement so the work can withstand the elements. The bottom hall of the piece is a grass mound.